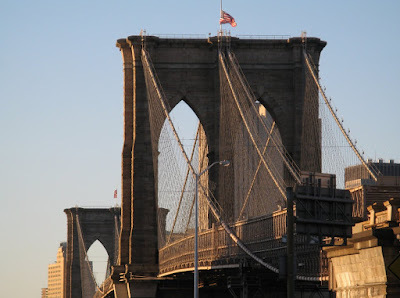 Hart Crane, "To Brooklyn Bridge"
This blog has alredy set records this month for both visits and page views (see here), and it's only the 20th. Thank you, my loyal readers. I'm curious, though (not that I mind at all), as to why it's suddenly so popular in British Columbia. Update: An anonymous interlocutor (from - where else? - Vancouver) suggests "DawnCoyote's jealous boyfriend?" If that's so, at least I have the comfort of knowing there's the breadth of a continent between us. But then I think of General John Sedgwick (see here). Concerning the provenance of hits. Dawn Coyote (click on "View Full Size" under her eyes for a vision that, if you're attracted to women, will make your heart palpitate) has used her Sitemeter to determine what Google searches have brought visitors to her blog, Fond Adversria, and reported the results here. I tried the same thing, but my results were quite prosaic compared to hers (yeah, I know, it's to be expected - no one wants to see my naughty bits). However, tonight one of my visitors had, as the URL referring to my blog, that for a post titled "Why Lying Works" in a blog titled "Survival Guide to Homelessness". I went to it, and found no link to my blog, either in the main post or in the comments. However, I found it well worth reading. Update: Dawn Coyote has replied with a lovely video clip about addled arachnids. Well worth a look. A sad note to follow a great season. As those of you who've read my posts on college football know, this has been a really good season for me, despite my premonitions of disaster at every turn. The Gators won the big one, and my alma mater, South Florida, had their first bowl triumph. Now this. I'm ashamed to say that my first reaction was to hope it wasn't the fault of the USF coaching staff; that Keeley Dorsey had some undetected somatic disorder. But all that matters is, as the Beach Boys once sang, "A young man is gone." Addendum: Today's New York Times has a story by Alan Schwarz (if you're not already registered with the Times, you'll need to do so to see the article; it's free) about the outcome of medical tests following the recent suicide of former Philadelphia Eagles defensive back Andre Waters (see bio here). Waters, who was 44 at the time of his death and lived in Tampa (coincidentally also where Keeley Dorsey died) had suffered from depression over the past several years. According to Schwarz's story, a post-mortem examination of Waters' brain tissue showed that it was similar to that of an octogenarian in the early stages of Alzheimer's. Over the course of his football career, Waters had suffered perhaps fifteen or more concussions. I'd be quick to say that, whenever I'm watching a game and see a player down on the field, whether he's with the team I root for or the other, I nod in agreement with the announcer who says, "Don't you just hate it when that happens?" I watch football to see the well-placed pass that threads the defensive needle, the graceful reception, the runner finding a gap in the line and artfully eluding defenders downfield, the defensive back tipping the ball away at the crucial moment, the field goal in the final seconds to win or go to overtime, even the punt into the coffin corner. Yes, but what about the jarring tackle that shakes the ball from the hands of the leaping receiver or lunging runner? The linebacker catching the quarterback from the blind side and slamming him down, or the blitzing safety plowing into him head-on? Well, these are part of the game too, and, yes, an enjoyable part. So long as no one really gets hurt. But how do we know? It seems that even Mickey Kaus thinks not (but you have to wait until the end of the discussion to find out). Am I alone in thinking that Kaus looks like someone who would beat someone else up for lunch money, and Robert Wright looks like the kid he would beat up? 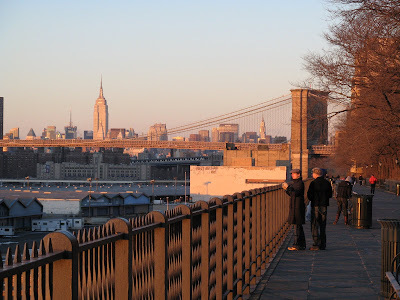 A few days ago, I was sitting here at the computer when the blast of a ship's whistle from the East River made me grab my camera and rush downstairs and across the street to the Brooklyn Heights Promenade (see here). 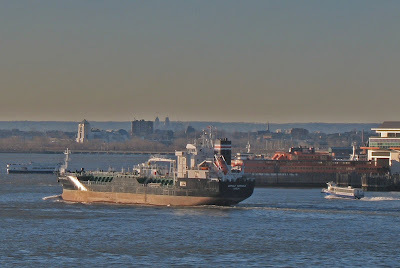 The passing ship, heading south into New York Harbor, proved to be Asphalt Seminole, a small (108 meters length, 9,400 deadweight tons) liquid asphalt carrying tanker. A little Google research showed her owner to be an Isle of Man corporation belonging to the Sergeant Group of companies, headquartered in Boca Raton, Florida, and her registry to be Irish (as "Dublin" below her name on her stern - click on the photo to enlarge - indicated). She was built in a Croatian yard, and her trading range is shown on her owner's website as Caribbean/South America/West Africa/Europe, so this voyage had her a bit outside her usual stomping grounds. What intrigues me about this ship is her Irish flag. Has the Celtic Tiger become a "flag of convenience"? I also found in my research a piece about a new container ship owned by the Evergreen group, of Taiwan, which flies the British flag. Has the whole flag of convenience game taken a new turn? My small contribution to blogger knowledge. If you want to attract visits to your blog, posting about a celebrity will spike your hit count for a short period, but blogging about a train will get you a steady stream of visitors. Addendum: David Carr, of the New York Times, has a column in today's business section about his experience as a blogger. He has the following trenchant observation about having a blog: "[T]hink of [the blog] as a large yellow Labrador: friendly, fun, not all that bright, but constantly demanding your attention." As I was still chuckling over that, however, I came to this chilling quotation from New York University professor Clay Shirky, with whom Mr. Carr was discussing blogging: "There is an obsessive, dollhouse pleasure in configuring and looking at it, a constant measure of social capital." I could say more, but it's time to go check my Sitemeter.